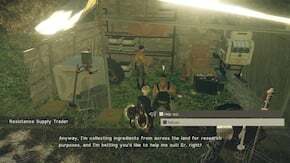 Culinary Researcher is a Side Quest in NieR: Automata. "The shop owner in the forest is researching human cuisine, and he needs help gathering ingredients. Find 1x Moose Meat and 1x Boar Meat, then give the supply trader the requested ingredients"
"You gave the ingredients to the trader, who has learned that meat is delicious when roasted over a charcoa fire after applying salt. The trader is going to continue his research so that he can prepare a feast when the humans return." This quest is unlocked by visiting the Forest Camp in the City Ruins after completing Camp Development. Bring 1 Moose Meat and 1 Boar Meat to the supply trader here. Does White Mooe Meat have any other use other than selling for a high price?